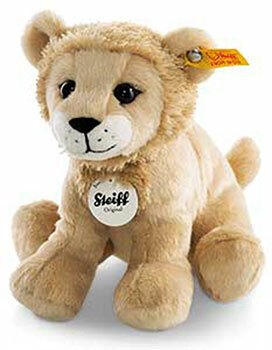 Steiff Asian Lion Discounts Apply ! Made from The Finest Soft Child Safe Fur in Soft Blonde. A stunning Big Cat Cub with Great Features . He is Both Cuddly and Soft But Stunning. From the best for kids collection, This Lion wears the famous brass plated Steiff button in ear and carries the yellow tag, which signifies it as a Steiff classic edition. This wonderful Best for Kids Steiff piece is machine washable. Safe for children. All textiles in the Steiff childrens range are tested for no harmful substances and certified by the standard Oko-Tex Standard 100 for child safety.